The Voice is coming to Nigeria! Top Nigerian vocalists, Waje, Timi Dakolo, Tuface and Patoranking, have been named as coaches for the music talent show. It’s an exciting time for us at M-Net. The Voice is an internationally renowned franchise and has consistently provided exciting television content whilst giving great opportunities to talented individuals to showcase their talent to the world. The Nigerian adaptation will be no different and our viewers can expect the best television entertainment even as we wait to discover the next generation of talented singers! Each Nigerian coach is expected to evaluate the contestants’ performances, while also guiding their team of selected artiste through the remainder of the season, in a bid to ensure that they win the competition. 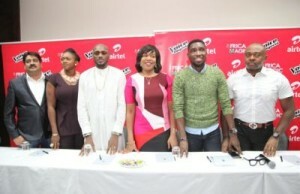 The Voice Nigeria, sponsored by Airtel, is expected to begin in April 2016.